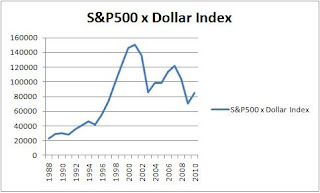 I have drawn up the chart to see the effect of multiplying the S&P500 and dollar index. My purpose is to show why non US investor must know the Dollar Index if they are buying US shares. US Dollar Index is the measurement of US Dollar value compared to other major currencies. To simplify the chart, I am using one value for each year taken from the beginning of the year. Please note that I have used Oct 09 value for year 2010. Let make a assumption that the movement of your share price is tied to S&P500. 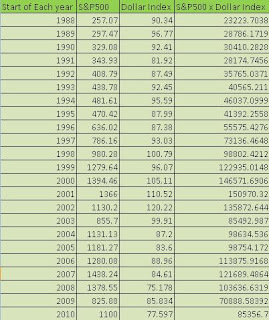 We can see that during year 2001, the product of S&P500 and dollar index is the highest. It means that if you are a non US investor, you will buy or sell US shares at the peak. In 2007, we can see the S&P500 have reach 1438 which is higher than 2001, but the product of S&P500 and dollar index is lower than that in year 2001. It means that if you buy US shares in year 2001 and sell share in 2007, you are in fact making a loss. The chart also shows that the value of US shares is getting weaker since 2001. The recent bear rally has only reached the value during year 2003. So don't you think US shares are still considered very cheap now? The question now is will it get cheaper or it is worth to buy US shares? Dollar index is more accurate as it is measure against a basket of different major currency. In this sense it is less bias than just using USD/SGD.